“The perception of all form is subject to the existence of light, be it natural or artificial”. 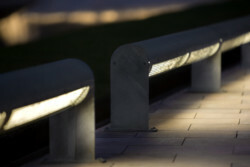 This is the philosophy held by Architectural Lighting Solutions (ALS), the team of lighting designers and consultants who collaborated with the B.Lux Group to develop the Tubular outdoor lamp. Based on the understanding that quality in architecture is determined by the use made of light, ALS applies a working methodology grounded in the implementation of digital models which simulate the results of their lighting proposals.